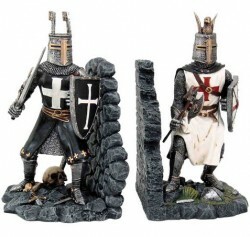 A pair of bookends featuring knights. One end has a black knight with a sword and shield. The other end has a white knight holding an axe and a shield. Weighty and unique bookends for the home. Price is for two bookends.